Through trial and error, this blogger discovered that DIY counters can be harder than they look. She shared her secrets to a successful project. 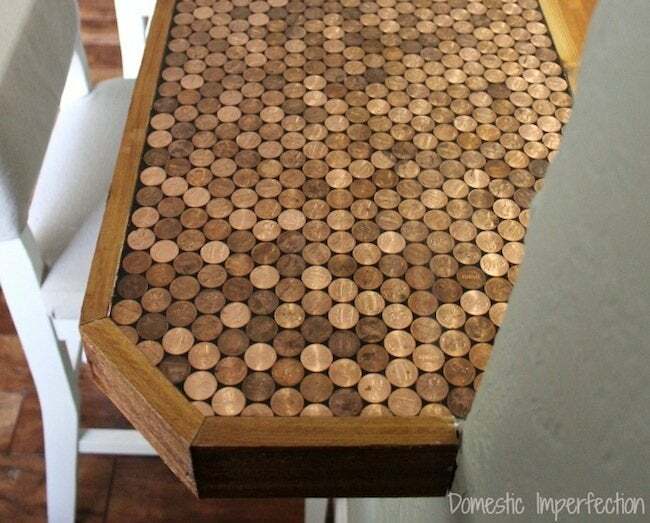 Ashley from Domestic Imperfection had her work work cut out for her when she decided to create a DIY penny countertop in her kitchen. 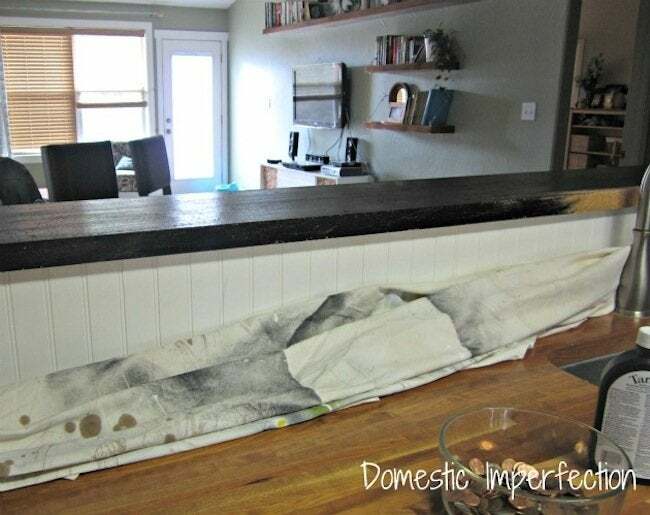 What seemed like a straightforward project took a few unlikely turns, but she recovered and has an amazing DIY countertop to show for herself. Find out how she did it by reading her tutorial. 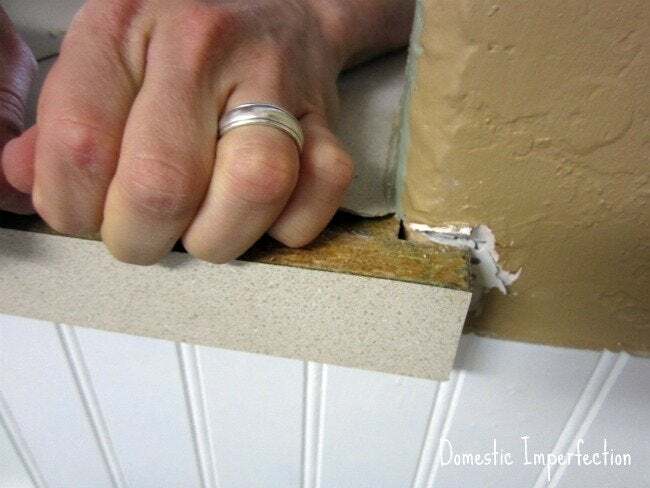 First we de-laminated the countertop to make it easy to get to the nails to remove it… except that there was NO WAY that sucker was coming off. Turns out that installing this counter was one of the few things the builders of our house took the time to do right. 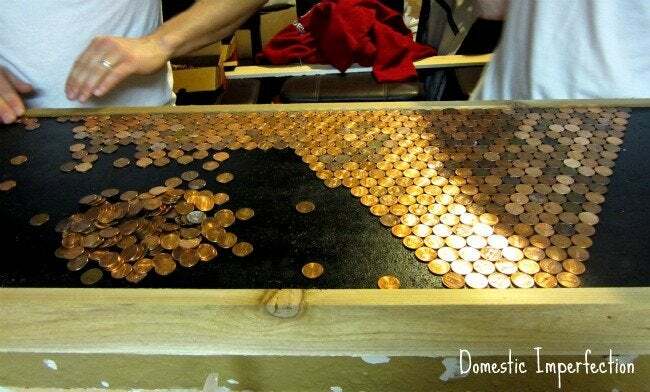 New plan – make penny countertop while installed. 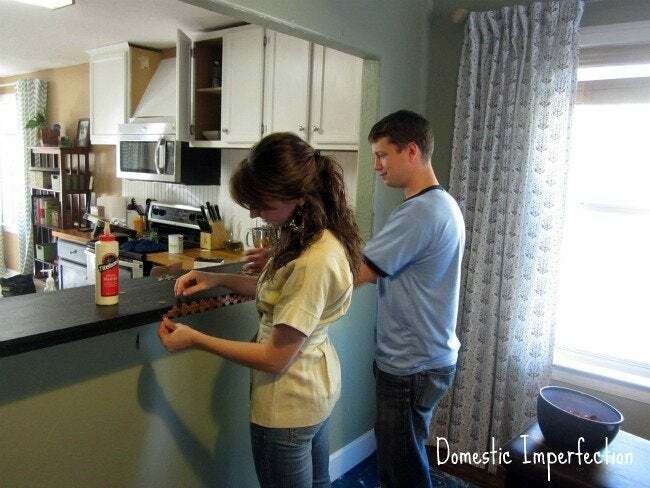 Then we painted the countertop black, since you were going to be able to see bits of it between the pennies. We made sure our pennies were shined the way we wanted them. Then the gluing began. so.much.gluing. I know there is a bottle of wood glue next to me, but don’t be fooled, it doesn’t work. We used Gorilla Glue. Here is where it gets messy. 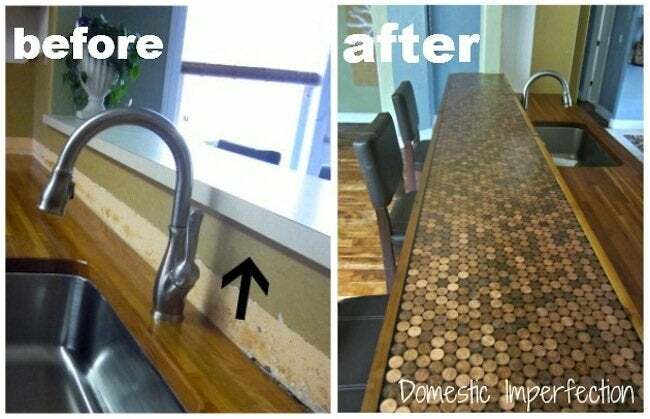 I wanted the pennies to wrap around the countertop and look all modern and awesome. To do this we had to cut A LOT of pennies… it’s not easy to cut pennies by the way. Now for whatever reason, the pennies kept not lining up. We came to the conclusion that we couldn’t have the pennies wrap around the edge. It was a very sad moment. 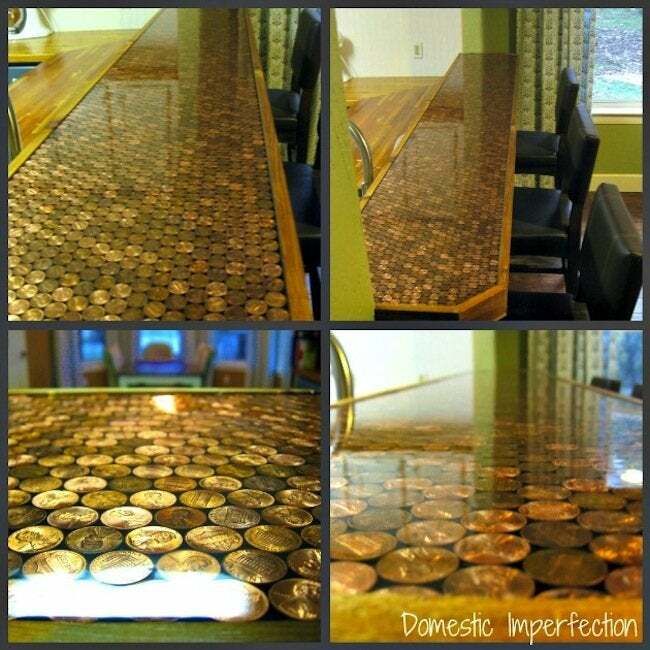 Not quite as sad, though, as the moment I realized that I had to pry all my carefully glued pennies off one by one. So after about a week of working on it, we were back to an empty black countertop. We brainstormed about what kind of edge to use and ended up using cheap rustic cedar. After adding the edge (with about a 1/8 inch lip) we filled it with pennies. We didn’t use glue or anything, it was super easy. WHY OH WHY did we not just do this in the beginning? Then it was time to epoxy. We just mixed according to instructions, poured, and spread with a putty knife. The epoxy was self-leveling, so we didn’t have to be too exact. We did get a ton of bubbles, so we went over it with the blow dryer to bring them to the surface. Whichever ones we didn’t get with the blow dryer I popped with a toothpick. Thanks for sharing, Ashley! For more helpful hints on troubleshooting your DIY penny project, check out her blog post. And don’t forget to visit Domestic Imperfection.